To be pregnant is not an easy thing. There is often much suffering for the mother in whom the new life is growing. But, there is also wondrous beauty attached to pregnancy and the pregnant mother becomes a reminder of the greatest good and the strongest hope known to humankind. She is a messenger in a sense. She is called expectant, a term which underscores the reward of patient endurance. Well, Christians share in something like pregnancy in that they carry a Life within them other than their own – it is the Living God Who has humbled Himself to come into their hearts and dwell there. This Divine Life grows within them and they are called upon to share this Life, to manifest it, to express it, in a sense to give birth to it. 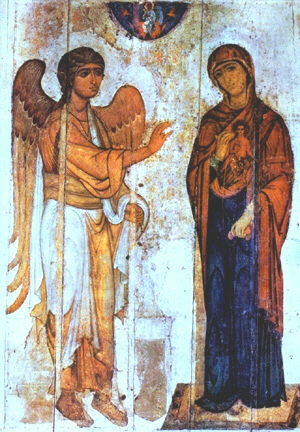 It is simple to see why God has provided us with the pregnant Mother of the Lord as a model. Her nine months of pregnancy were not easy but they were tremendously beneficial. As the Child God formed and grew in her, she was formed by Him and grew closer to Him. We too must allow God to be formed in us and grow in us so that we, like Mary, can likewise be formed by Him and grow closer to Him.